Residing in the Choco region of Colombia, Capurgana is a kind of city fit for the most adventurous soul. Capurgana lies in the Caribbean, near the Panama border. What makes Capurgana stand out from other cities in the country, is its topology. The city is at the base of the Baudo mountain range foothills, adjacent to the famous turquoise waters of the Caribbean. It is also very close to the Darien Gap, a jungled area that separates North and South America. Capurgan· is not exactly an island, but it has the feeling of being one as it is sleepy and laidback. It has been popular among Colombians, but it is increasingly making a name on the international traveling scene. This is also one of the few places where there are no cars. There are no paved roads here so the main transport is bicycles and horses. But, the good news is that the city is small enough to be explored on foot. Very close to bays and beaches, Capurgana is the ideal place for beach lovers; but the more active visitors do not often get bored in this place, as many activities are always available like horseback riding, hiking and island excursions. 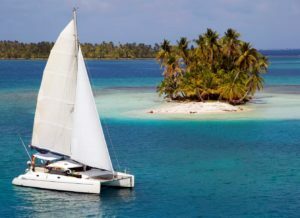 The sailing excursion to the San Blas Islands is also one of the main highlights of a stay in Capurgana. The San Blas archipelago is composed of more than 300 small islands, so thereís plenty of places to explore and enjoy. Another adventure destination here is the La Dian waterfall, home to the Black Howler monkeys. A lot of visitors tend to use this city as their base, and then explore neighboring attractions such as La Miel, El Aguacate, Sapzurro and El Cielo Waterfall. 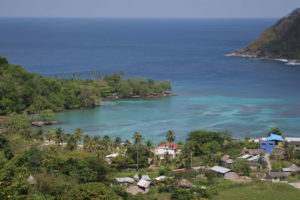 La Miel is a renowned beach destination while El Aguacate is a beautiful bay just south of Capurgana that exudes a very off-the-beaten-path feel and offers good surfing opportunities. However, there is not much in the way of restaurants or cafes in the area. So if you decide to come here, make sure to bring your own food. Sapzurro is also a heavily favored tourist destination packed with natural attractions. El Cielo impresses with its series of waterfalls and pools tucked within the forest. 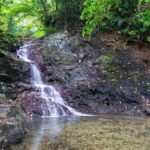 La Miel, El Aguacate, Sapzurro and El Cielo Waterfall all have hiking trails that connect them to Capurgana. So if want to spend most of your time doing very scenic hikes, Capurgana is definitely the right place for you! Mostly Capurgana remains an almost hidden gem, as it is not as popular as other South American destinations. If you come during low season, the remoteness and serenity of the place is even more pronounced. At that time, you can choose to hang out at one of the Capurganaís Caribbean beaches, and you will most likely have it all to yourself. Capurgana can be reached by land or sea. 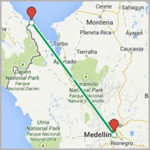 It has a small airstrip and airport that facilitates charter flights from the city of Medellin. Other travelers including backpackers tend to come here by sea from places like Puerto Obaldia or Turbo. Once here, it is easy to find hotels and restaurants that suit your budget. ATMs are hard to find, so it is better to come here with enough cash to last you for your entire stay. For a map of Columbia, go HERE. For a map of Panama, go HERE.